A fascinating and inspiring woman in her own time, with a legacy that continues to provide inspiration more than a century following her original methods. In the late 1800’s, children in Italy and other parts of the world were perceived as ‘empty vessels’ waiting to be filled with information. Thus they were expected to sit still for long hours and memorize facts, and follow teachers’ directions precisely. While Maria was interested in medical school, wholly uncommon in her time and culture, her father believed female education should be limited to certain subjects (specifically those found in a classical education which focused on the study of literature, history and the languages of Ancient Greece and Rome). Conversely, her mother was from an educated family and encouraged her pursuit of education—atypical for women during that time. Despite the lack of family support, Maria Montessori moved forward, facing the challenge of being the only woman admitted to a medical school in which dissection of cadavers was a necessity, yet not allowed to do so in the company of men. She worked around this by dissecting in the evenings on her own. The lack of respect and outwardly signs of disapproval she received from her male colleagues did not help, but rather spurred her dedication to her work and success. Her hard work resulted in graduating from medical school, winning over the respect of her professors and classmates, as well as being awarded for her work in pathology and gaining a position as an assistant in the hospital at the university. Additionally, Maria Montessori was invited to give a class lecture during her final academic year, where she received a standing ovation—at which her father attended and which many believe resulted in ending their estrangement. Not only did she graduate at the top of her class, specializing in surgery and diseases of women and children; Maria Montessori was the first woman in Italy awarded a medical degree; and received a score of 105 out of a possible 110 points on her thesis. Montessori held a holistic attitude toward patient care, which in her later years grew into what she referred to as “practical life” activities for children. She also believed that being able to care for oneself or a family member helped to create a healthy being—mind, body, and spirit. She often cared for the poor in her early years as a doctor, and believed simply prescribing medicine alone would not keep one healthy. The task of everyone helping to keep the household running—from cooking, to cleaning, to self-care was especially important. These were the basic skills Montessori felt needed to be learned and practiced by even the smallest of children. Following her early career work in an insane asylum, Dr. Montessori came to believe that children’s minds and bodies weren’t so much useless (as was commonly thought), but rather were unused—deprived of experience and stimulation since they were at this time placed alongside adults with major psychiatric disorders. At this time, Dr. Montessori’s work with mentally-disabled children had been influenced by three men: Edouard Séguin (1812-1880), Jean-Marc-Gaspard Itard (1775-1838), and Jacob Rodriguz Periera (1715-1780). She began studying other ideas about children’s education when she audited university courses in pedagogy from 1897-1898, and studying 200 years worth of published works regarding the education of children. Four educators had a profound influence on Dr. Montessori: Jean-Jacques Rousseau (1712-1778), Johann Pestalozzi (1746-1827), Robert Owen (1771-1858), and Frederich Froebel (1782-1852). Later, through her observations at the Orthophrenic School in Italy, Montessori identified children’s skills and needs and explored new ideas of matching appropriate activities to their abilities. She demonstrated to the children how to do a task, then allowed them to repeat the task as often as desired. After a few months in the program, Montessori noticed that some of the children were capable of reading and writing; of passing tests given to children in regular schools, and above all proving they were capable of far more than thought to be. While at the Orthophrenic School in Italy, Montessori began developing methods and forming ideas regarding the repetition of tasks well-matched to the children’s skills and needs, and noticed after several months that the children were indeed capable of reading and writing; of passing tests given to children in regular schools, and above all proving they were capable of far more than thought to be at that time. Following her work at the Orthophrenic School, Montessori continued her education at the University of Rome with her new focus on becoming an educator. She studied philosophy, anthropology, and psychology. Montessori also attended conferences and published papers and was in demand as a guest speaker regarding her experiences. In 1904 she began work as a professor for the University of Rome Pedagogic School, giving lectures; which later formed the basis for her first published book regarding a new approach to education. The theme for Montessori’s first published book was unique for its time as it focused on a new approach to educating children that involved the study and understanding of what children needed rather than what adults thought children should need. The book also contained a variety of visual aides. At this point, several bankers asked Montessori to take on the challenges of keeping the children of San Lorenzo—a slum—safe and out of trouble. One reason Montessori took on the challenge of watching over the children in San Lorenzo was that she was interested to see how the ideas and methods she had developed earlier faired with non-disabled children. She also had the foresight in being able to apply her ideas to more than just the children of San Lorenzo since the bankers were renewing other slums and planned to make similar provisions for the care of those young children as well. San Lorenzo became the first Children’s House, or La Casa dei Bambini. 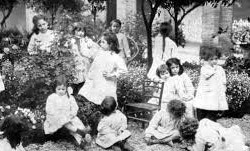 Maria Montessori learned through observation that children showed the ability to concentrate on a task which interested them and would repeat that activity when they could; thus repeating their concentration. The children preferred having order in their surroundings and being able to help maintain the order. They also preferred real materials vs. play versions, working in silence, learning manners and socially acceptable behavior as well as lessons in personal care. The manner in which children learned was also important—having freedom to choose their own work based on interest, doing the work independently, having the opportunity to self-correct mistakes and finally, feelings of self-satisfaction (an internal reward vs. an external reward). Montessori’s beliefs about incorporating movement in the children’s environment had a positive influence on the children physically and mentally. Free-standing, child-sized chairs and tables were introduced, allowing the children to move the furniture as needed themselves; thus developing gross motor skills. She also introduced the use of individual mats since this appealed to the children’s enjoyment of lying on the floor. This demonstrated a certain respect towards the children and allowed them to feel valued and ultimately, relaxed and comfortable. Over time, Dr. Montessori continued to develop her Method with an approach to Cosmic Education, an overall Montessori approach that promotes children’s awareness of the world around them — everything in the universe — and how it is connected and interdependent. Children learn that they are each a part of the whole and they can contribute to their world and thus help to create harmony within their lives and their surroundings. Dr. Montessori also developed the term ‘Normalization’ — the mental state teachers work to achieve in a Montessori program. This normalization occurs when children approach their work/studies with enthusiasm, need little direction, treat others respectfully, and work quietly with focus whether independently or cooperatively with others. Despite work and play often being of differing value, Montessori believed the two could be combined so that work is effort that has value to the child, as well as the environment, and society; and yet is still enjoyable and interesting, and thus valuable to do in itself. Since play is an important part of childhood; one to be taken seriously, it is then considered work and should not be interrupted. In the classroom setting, ‘work’ is still the term used by Montessorians as it indicates value and respect to the child ‘working’ on his or her chosen material or activity, and which may also be perceived as play to the child. Due to the growing interest in others wanting to learn more and develop similar schools based on her ideas, Montessori decided to focus on speaking to people the world over regarding her methods. 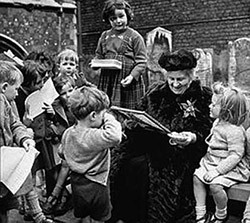 Since 1911, Montessori had devoted herself to public speaking and people went to Rome to hear her speak and attend her courses. By 1913 she realized the need to offer teacher-training courses internationally; traveling to major world cities including the United States, where 100 Montessori schools had already started. Montessori became quite popular throughout the world, and in the US was even invited to the White House as well as prominent homes. Famous and progressive-thinking individuals endorsed her methods including Alexander Graham Bell and Thomas Edison. The focus of her talks in her final years was on the importance of educating children about peaceful living. Montessori saw herself as a citizen of the world and thus decided to be buried wherever she died – which was on May 6, 1952 at the age of 81, in Noordwijk aan Zee, Netherlands.